Germany - An Iranian delegation upset its German hosts by refusing to tour a concentration-camp memorial, the city council of Weimar in eastern Germany said Thursday. 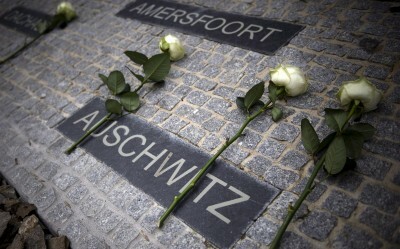 Berlin has regularly protested against Iranian President Mahmoud Ahmadinejad’s denial of the Holocaust and his calls to wipe the state of Israel off the map. Denying that the Nazis committed genocide against the Jews is a criminal offence in Germany. Germany established the Shiraz-Weimar connection to keep people- to-people links alive while the governments were at odds. Why would they go to a concentration camp. Last year they had their investigation into the holocaust and the representatives of Neturei Kartei who attended probably assured them it was a Zionist plot. It would be a disgrace to the honor of the Kedoshim if they DID go! Noch Besser! Who wants these sonei yisroel traipsing around anyways! The truth hurts. Sheker cannot go to Emes...it would be the antithesis of what they represent. What are the Germans, dumb? Of COURSE the Iranian delegation would refuse to visit Buchenwald. First, Iran's official position is that the Holocaust never occurred, so for an Iranian politician to visit a concentration camp that establishes that the Holocaust is fact occurred would be counter to government policy and probably would get that politician in a heap of trouble. Second, any Arab visiting any place that gives proof for Israel's raison d'etre is risking execution by his own government. Its one thing to extend the invitation knowing that it will be refused. Its another to be surprised at the refusal. “ What are the Germans, dumb? Of COURSE the Iranian delegation would refuse to visit Buchenwald. First, Iran's official position is that the Holocaust never occurred, so for an Iranian politician to visit a concentration camp that establishes that the Holocaust is fact occurred would be counter to government policy and probably would get that politician in a heap of trouble. Second, any Arab visiting any place that gives proof for Israel's raison d'etre is risking execution by his own government. Not so fast. The Iranian delegation knew beforehand that Protocol requires them to visit . This is an insult to the germans not the Jews . The Germans are not dumb.Cruel , yes but not dumb . Meanwhile the Iranians (with Ahmadinejad) kept those clowns, (at the Holocaust denial conference) up front, with the Iranian security guards keeping a watchful eye on them. Because there were some real nazis wanting to do harm to them. But ahmadi (yms"h) finally cut his ties with those morons, because he's afraid that a Mossad agent could be disguised as one of them and do a number on him. (Noch dos felt ous.)! They're a bunch of hypocrites, besides all their other good attributes. do you think they don't know the truth?! They just want their 15 Minutes of fame. It looks like that little Weiss boy (who purports to be their spokesperson.) didn't get enough attention as a little boy in his previous non-religious, pre-BT life. not to mention the nazis shooting and gassing them!!! Today a visit to Buchenwald is meaningless because it is a sanitized version of the Buchenwald I saw. The electrified fence is gone, the watchtower manned by Totenkopf SS does not exist, the stench from the crematoria burning bodies is no longer present and most of all the walking skeletons of prisoners from various nationalities are not there. Today you have a symbol of utmost barbarism still supported by some "civilized" groups. Buchenwald fortunately did not have a gas chamber, outside of Poland only Austria had the price of a gas chamber of Mauthausen near Linz.